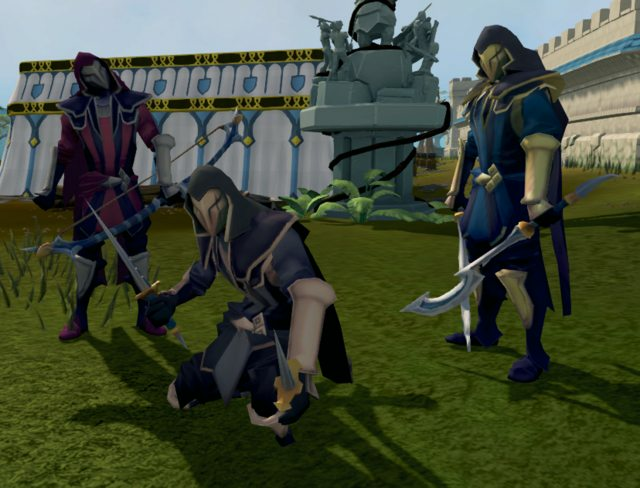 New Assassins have come out of the shadow in the lands of Gielinor, and beckon you to join them. From 00:00 game time on Wednesday 24th January through to 23:59 game time on Monday 29th January, complete tasks on the Assassin’s Contract to earn fabulous new prizes, including the fearsome Faceless Assassin outfit. Get your contract by opening Treasure Hunter (Ironmen should speak to Diango) during this promotion. Complete all 16 tasks on the Assassin’s Contract to unlock the full outfit in blue, then prestige and re-complete the tasks multiple times to unlock more colour options, plus weapon overrides and the assassin’s walk override! Want to get those rewards quicker? You can win the assassin walk override directly from Treasure Hunter, or subcontracts which allow you to skip the tasks you don’t want to do. Note that the subcontracts cannot be banked due to the functionality change if you fully complete the contract. Ironmen should speak to the Faceless Assassin hiding somewhere around the world to tick off the Heist minigame task automatically. May your training be swift and your adventures as a Faceless Assassin be bountiful! Toss a coin and call heads or tails; if you call it right, the tasks are actually feasible to do without using keys. If you call it wrong, the card will be a zombie bingo card reincarnate. But yeah, even though this isn't an exp promo, which is nice, it can still be easily abused by Jagex and thus, the outfits should be put on Solomon's store instead. Ah, about time we finally get a bingo card promo! I wasn't back from my break when the zombie promotion was out. If you don't mind me asking, what did the bingo card consist of in terms of tasks it wanted you to do? Personally I was able to complete the bingo cards that preceded this one pretty easily, since I had all the requirements to do them and they were fairly decent time-wise to complete, but this one, even though I also had all the requirements for, was just way too much grinding. Pretty much everyone else agreed, and part of the reason why the zombie walk token got so expensive real fast was when many people had to resort to buying it with gp instead of earning it by fully completing the bingo card. Oh boy, I see what you're talking about with the Walk Like a Zombie tasks. This might be tedious to complete, especially with the prestige system. We need more promotions like this without the gambling aspect. The brightest ideas are the most undervalued. This alone raises a red flag for me. What would be better in terms of getting the complete outfit? Winning the subcontracts or doing the task?